Being an NFL player is a job. No two ways about it. A team employs a player and like a civilian job, players sometimes move on. It’s a very public job change but it’s a job change all the same. That’s why it’s refreshing to see players thank their most loyal customers, the fans, when they leave for another team. 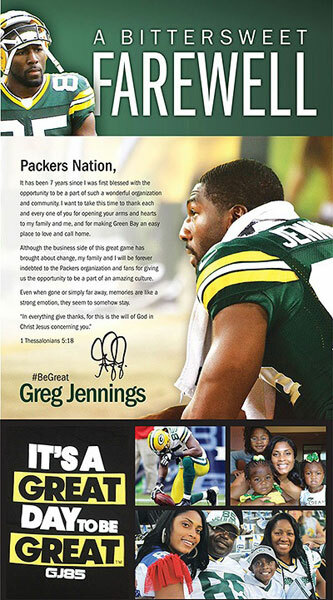 In the past few weeks notable NFL players Greg Jennings and Ed Reed both took out full page ad’s in their local paper to thank the fans. Both had terrific careers with their former teams. In fact they were such good careers that both walked away with Super Bowl rings and both we’re All Pro’s. in other words, they brought the fans a lot of joy or if you prefer, they excelled in customer satisfaction. Sure there are some fans who are happy to see them go. There are even some fans doubting the motivation behind the full page ad’s. A lot of stock holders were upset at Steve Jobs when his was run out of the company he founded so many years ago too. The world seems to move on regardless. It is, after all, a job. That’s the part that people for forget, it’s a job. Maybe not like yours but a job none the less. Jennings and Reed both gave a lot of real great years to their former employers. Now, they’ve moved onto to new employers for good money where they can hopefully make a difference and bring their new employers customers a few years of satisfaction. So before you chastise the player or his former team remember, we’re you upset at a former coworker who left the company for another position somewhere else? We’re you upset that they moved up the economic ladder? Did those employees take out full page ad’s in the local paper saying “thanks”? Maybe they should start.